It's going to be Halloween and you know what that means: it's a race to collect the most candy. As a kid (and a serious candy collector), you know how important it is that you score the most sweets. Whether you're in competition with your fellow siblings or you're up against all the kids in your neighborhood, it's important that you are the trick or treater that is victorious by the end of the night. You may be wondering: how does one procure the title of ''best candy collector" when there's so much competition out there? There's plenty of cute kids in adorable costumes that could potentially steal your thunder, so you need an infallible way to get the most attention when you're going door to door. Introducing the wacky waving arm man costume! If wacky arm wavers can attract promising customers to a store, then you can bet that a wacky waving arm man costume will land you tons of attention this Halloween. 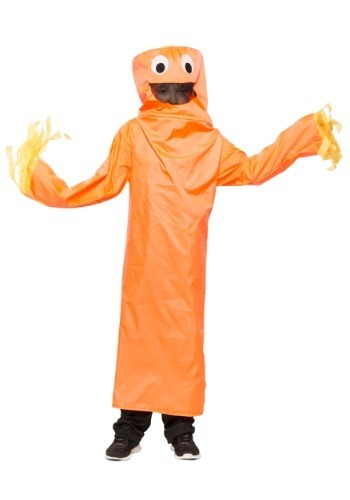 Wiggle those crazy arms as fast as you can once you're wearing the tube-shaped orange robe. Flail, spin, and shimmy the yellow fringe at the end of the sleeves while peeking through the mesh covered peek-hole. With the bright orange over-the-head costume combined with your commitment to thrashing your arms back and forth, you'll surely win tons of recognition from those passing out treats. If someone throws a single Tootsie Roll in your bucket and you feel as though you've been cheated, stand in their front lawn and wiggle your arms fiercely until they give you more candy. It will be the wackiest way anyone has ever won the title, "best candy collector."